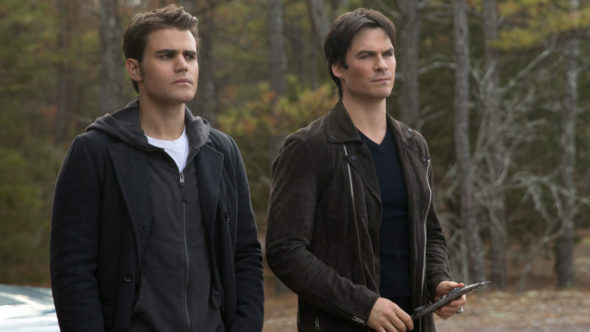 After eight seasons, The Vampire Diaries is ending tonight, March 10th. Recently, showrunner Julie Plec spoke with The Hollywood Reporter about ending the CW series. But what we want to know is: Would you have watched a ninth season of the show? The supernatural drama revolves around the search for love and the battle between good and evil in the supernatural-charged town of Mystic Falls, Virginia. The cast includes Paul Wesley, Ian Somerhalder, Kat Graham, Candice King, Zach Roerig, Matt Davis, and Michael Malarkey. We had two hit lists. We had one, who do we want to see again? Because in a season when we’re leading up to goodbye, being able to get one final look at some of our beloved characters was most important. And then the other was, what have we not resolved? In 171 episodes, what are those dangling chads that will haunt us until the end of time if we don’t get answers to those questions? Given that one dangling thread, do you think there should’ve been a ninth season of the The CW series? Would you have watched? Is it ending at the right time?Tell us what you think. I hope the Originals gets a season five now.. Season 4 only has half the normal number of episodes! TVD was my FAV but at least I still have TO.